Essential reading for all students, student voice practitioners and educational leaders. Student responses to what goes on in classrooms can provide valuable insight and demonstrate the obvious, that having been ‘schooled’ since 4/ 5 years old students actually have a lot of experience in terms of what makes for a good learning experience. A student perspective can enlighten, animate and inject a different dynamism of energy. The vitality of young interested minds: if you show interest you get interest back. Magic formula. This episode features Anneka Williams, Maura Riley and EJ Morgan, three students from Harwood Union High School in Vermont. Anneka Williams, Maura Riley and EJ Morgan are seniors at Harwood Union High School in Vermont. The three of them are student leaders at their school and represent membership in student government, Youth and Adults Transforming Schools Together (YATST), Class Council, and community service. 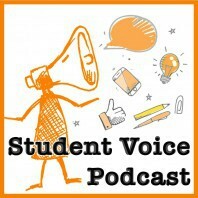 Anneka, EJ and Maura are interested in promoting student voice and partnership not only at their school but globally. All are interested in changing the world and helping students recognize their potential to initiate change.